Well, I never thought that I would be writing this kind of blog post ever again, but here we are. I must admit, even though I always said I didn’t want another and I was happy with just Emily – I’m delighted to say that we’re expecting again. Yes! Emily is being promoted to a big sister! I took a test on November 3rd, the reason I took it was because I felt weird. Not weird as in ‘I think I am pregnant’ but more along the lines of I can’t stop being sick and I know this isn’t a stomach bug. After waiting the painfully long 2 minutes which felt like forever – we got a positive result. I couldn’t believe it, Sam was over the moon, in his mind he has always wanted two children. I was happy too, but I was also filled with anxiety and dread if I’m honest. I’m not a good pregnant person, which is what put me off getting pregnant for the second time. I always joke and tell people I wasn’t made to be pregnant, my body hates it, and it’s true. There is also that added worry of a miscarriage, anyone who reads my blog regularly will know that I have experienced 4 miscarriages now (3 prior to Emily, and 1 after) and naturally when I got that positive, I was brought back to that feeling, of worry and confusion. I felt like I was in limbo, trying to find a balance between fear and hope. Just when I started to accept the positive pregnancy test, I started bleeding. I had cramping and bleeding when I was in the early stages of pregnancy with Emily, but with my history of miscarriage I wanted to get checked out, so I rang the doctors and booked an appointment for an early scan. Here is my little diary entry from the day I found out I was pregnant and then bleeding. I’m not sure if this will ever get posted, maybe it will, who knows. Today is November 3rd, my day was pretty normal, Sam went to work, Emily was her normal toddler self. I however felt different, strange in a way. I have been feeling this way for about a week. I’m tired, all the time. I have no appetite, and I feel sick. We recently experienced a miscarriage and it was hard, they always are. As regular readers will know, I had 3 prior to having Emily. I feel like I am kind of immune to it a little, don’t get me wrong, every time they hurt and I feel like I have lost a piece of me, but I feel like after the initial shock of a miscarriage – I just go through the motions. The anger, the hurt, the questions, the sadness, and then I pull myself together as best as I can and carry on. 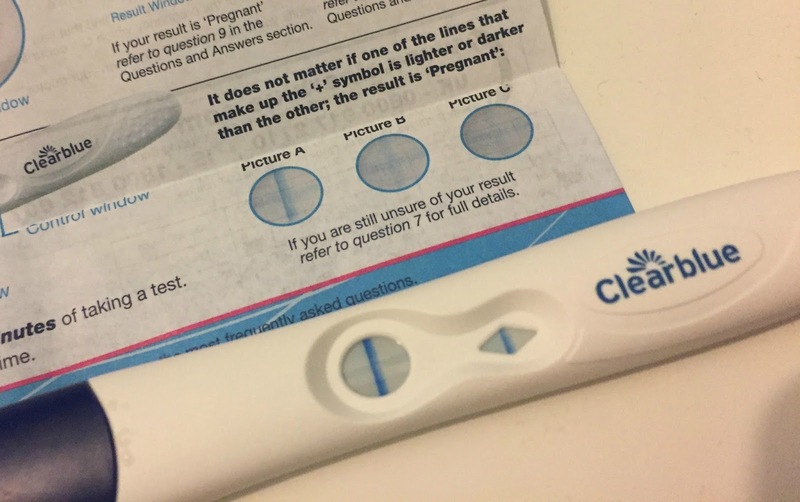 Today, I found out I was pregnant, again. Working out the dates from my last period, I am about 6 weeks. I honestly don’t know how I feel. I sobbed my heart out when I saw that positive. It took a good 5 minutes to sink in, then I was happy, for a brief second, then I was shattered by nerves and fears. What if I miscarry again? I really don’t want to get my hopes up about this pregnancy, because I don’t want to get too attached and lose it, but I don’t want to spend the whole time worried and scared about could happen. It comes down to feeling like you have lost control. It is my body, but I have no idea how this pregnancy is going to turn out, will I have another rainbow baby, or will I be completely devastated again. All I can do is stay positive and eat the right things, and wait. That’s the hardest bit, waiting. I guess either way I probably will post this – I know out there, there is someone else feeling the way I’m feeling right now. I could make my little girl a big sister – I’m sure she would love that. At the same time, I could lose the baby and be filled with guilt and hurt again. I guess only time will tell. So tomorrow I will be ringing the doctor, and booking in for an early scan. I have started bleeding, its only light and I’m sure it is spotting, but I’ve had slight cramps. I had this with Emily, and I’m hoping that it is just implantation bleeding like it was with her. I guess I will take it day by day, and see what happens. The thing is, now I know, I just want to forget about it. Pretend it’s not happening and then if there is a little bean growing in there it can do it without my worrying – not forever of course, but just for a little while. I never thought I would be in this position again, I thought after having Emily miscarriages were a thing of the past and we would be able to conceive again easier – I know how silly it sounds. I want Emily to have a sibling in the summer. I want to be a family of four. It seems so simple to everyone else, I know it’s not really like that though, miscarriage isn’t something that is spoken about very often – but what do I do if it happens again? I’m not sure my heart can cope with another loss. This is pregnancy number 6. That’s 4 miscarriages, one rainbow baby and this little bean. So, I rang the hospital and they booked me a appointment for the 8th, which was fine - but it did mean a wait of 4 days. Those 4 days felt like 4 weeks. I was still bleeding, not massive amounts but enough for it to be noticeable, I also still had the craps. I guess if it was just one or the other it would have been a tad easier to cope with. My mind would have been at rest a bit more, but that sadly wasn't the case. While excitement was building inside Sam, I’m sure he was worried too – he can just hide it better than me. I was full of anxiety, and I didn’t really know how to cope with it. I went quiet, and just delt with it in the only way I knew how – to get on with things and keep busy. So, its good news. I feel relieved, for now. 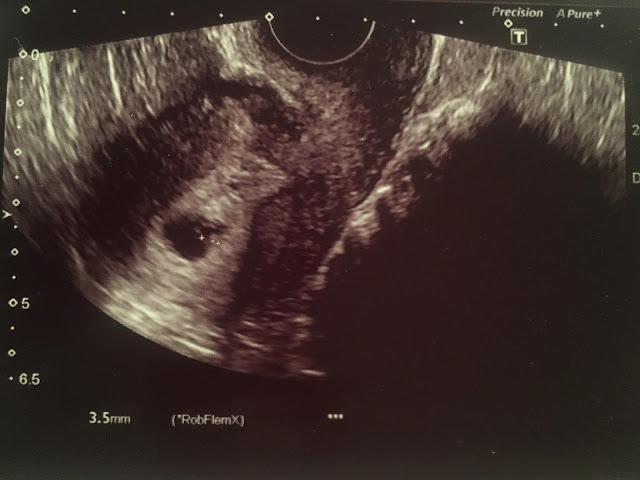 I still don’t have that pregnancy feeling, but I saw our little baby. Our little bean. The midwife who did the scan was fab, it was the same midwife who did all of our early scans when we were pregnant with Emily – her name is Bobbi. It is weird how reassuring it was for me to see her face. I felt like it would all be ok because it was her, and she was the one who told us Emily was fine. Speaking of Emily – she HATED the whole thing, I had to go behind a curtain to get ready for the scan and Emily was not happy about it, we then added to her dismay by turning the light down so that Bobbi and her trainee could see the screen properly. I’m not sure why I agreed for there to be a trainee in there, as she made me feel 10x worse than I felt before. She took forever and wasn’t very positive about the whole thing, Bobbi had to keep reminding her to reassure me that everything looked ok with bean. I get that everyone has to learn somewhere and somehow, but it isn’t nice when you have extreme anxiety and a history of miscarriages. I guess the fact Sam had to take Emily outside the room to calm her down didn’t help, as I was all alone. Sam did get to see bean though – which I am so glad about. Bean has a strong heartbeat and is measuring at 4.2mm (which is so so tiny!). Bobbi booked me in for a scan on the 22nd, she estimates that ill be about 8 weeks then. While she explained that it is completely normal to book a scan for a further two weeks, it didn’t help my anxiety at all. I now feel like I am waiting for the next appointment before I feel like I can really breathe properly and come to terms with the fact I’m having another baby. I’m not to sure if I will ever post these little diary entries, but I have always found blogging and journaling therapeutic, it’s the way I was taught to deal with my anxiety. So I plan to carry on writing them. I will be posting my 8 week post soon..